What is the relationship between ‘myth’ and the art of following Jesus? Ought we to treat the reports we have in the canonical gospels in the same way as we may treat the tales of Thor, Osiris or Hercules? To many readers, Lewis is famous (and in some circles infamous) for incorporating numerous aspects of the Christian story into works of fantasy for children; the Chronicles of Narnia. I read them often as a child and near-completely missed the religious references. Now, of course, these stories make more sense. It was, however, in the process of making sense of them that I was able to understand the brilliant Oxford scholar’s understandings of God’s story and, through his insight, make more sense of the world. In considering Christianity and myth, it is worth explaining a well-known and slightly blurry distinction between myths and legends. Myths are cultural stories unconnected with history, while legends have some kernel of truth concerning distant events buried within them. Perhaps the figure of Jesus, so clearly located within our own world, should not be treated as myth but instead regarded as a legend? Could the details of his exploits simply be clever stories devised with dodgy motives and no more historical than the stories of, say, Maui or King Arthur? This is, perhaps surprisingly, not a difficult question to answer. In a world befuddled by and besotted with claims of subjectivity and religious inclusivism, we can forget that when we turn to the New Testament we are dealing with historical writings which make historical claims of a factual nature. Yes, many claims are difficult to substantiate from outside these pages, but some key ones are not. Was Luke, for instance, the careful historian that he claims (Luke 1:3) – when he talks about historical people, places and happenings? The answer, from various archaeologists and experts on the Roman world, appears to be yes. If Luke, for instance, can be trusted in the small things of geography and government, we are not justified in simply dismissing his claims concerning God and His specific actions in history. There are of course other objections. Some claim that the details of Jesus’ life sketched in the gospels are clearly derived from earlier pagan sources; a couple of Egyptian gods are prominent, as is Buddhism and other eastern religions. It is argued that the resurrection and accompanying details can be derived from the Mystery Cults widespread in the first century of the common era. There is a quite a bit of scholarship on the topic; for ease of access, there is a good digest of the different arguments on this page at Tekton. To summarise: many of the claims are bogus; a few are most likely a result of Christian influence on other religions; the primary sources for the more-impressive claims are not recorded and there is often a reliance on superficial appearances of etymological similarity without any reason for supposing a real causal link between certain names or themes. If we are to treat the gospels not as myth or legend but as rooted in history, we should ask how the gospels compare in the essentials with other historical works of the time? Even a cursory look into Classical Studies will show that the records of great leaders such as Alexander the Great are beset by many problems resulting from widely differing sources – yet they are still deemed essentially historical. 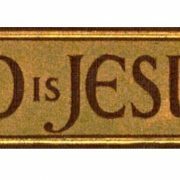 The broad lines of Jesus’ life have attestation from numerous accounts including many secular references. In the Gospel and other New Testament records we have an embarrassment of riches compared to any comparable secular writings. For the majority of ancient historical works there is a massive gap between the earliest manuscript copies we have available and the original written text. The NT radically breaks this pattern with numerous fragments and even whole manuscript-books from the second and third centuries AD. The once-popular claim that various items in the canon were written in the late second century have fallen foul of papyriological and other evidence. The gospels were written within the lifetime of eyewitnesses – period. “So that is the outline of the official story—the tale of the time when God was the under-dog and got beaten, when He submitted to the conditions He had laid down and became a man like other men He had made, and the men He made killed Him. This is the dogma we find so dull—this terrifying drama of which God is the victim and hero.” (Dorothy L. Sayers, The Greatest Drama Ever Staged (London: Hodder and Stoughton, 1938), p. 15). It is good news: the Creator God is not indifferent to the human condition and has entered into the storybook of history. And he waits, ready to enter into the story of our own lives. 1. “The textual critic of the New Testament is embarrassed by the wealth of material… Besides textual evidence derived from the New Testament Greek manuscripts and from early versions, the textual critic has available the numerous scriptural quotations included in the commentaries, sermons, and other treatises written by early Church fathers. Indeed, so extensive are these citations that if all other sources for our knowledge of the text of the New Testament were destroyed, they would be sufficient alone for the reconstruction of practically the entire New Testament.” Bruce M. Metzger and Bart D. Ehrman, The Text of the New Testament, 4th ed. (Oxford: Oxford University Press, 2005), 51, 126.